East Grand Rapids Middle School art teacher Holly Lampen was planning a “frog apocalypse.” Ninety paper-mache amphibians will soon hang from the school ceilings and climb up the walls. “We are going to invade the school,” she said, as her students slathered newspaper with a gluey solution onto their frogs. When dried and painted, the frogs will surprise non-art students with their sudden presence. “90 frogs!” squealed seventh-grader Carrie Kirchgessner. 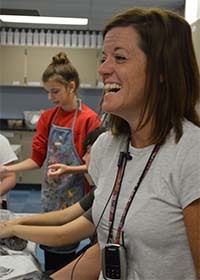 Lampen, who has taught art in the district for 18 years, has a reputation for making school fun with her creativity and tendency to set students loose with projects. Art is all over the place at the school, with student-created murals stretching across hallways and unique pieces scattered throughout the building. Many were made in collaboration with professional artists commissioned by the district through grants from the East Grand Rapids Schools Foundation. Many have touched the greater Grand Rapids community in some way. 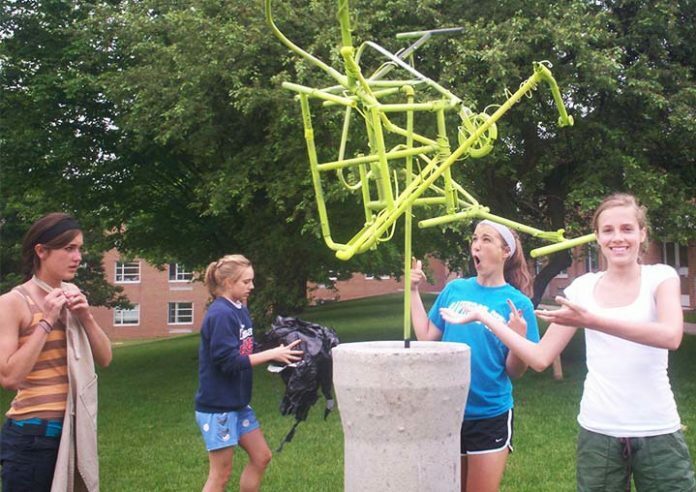 Students have broken down 30 wheelchairs with the late Dennis Theisen, a local artist and professor at Kendall College of Art and Design, to make sculptures and raise money for Alternatives in Motion, which provides used wheelchairs and repair services to families in need. 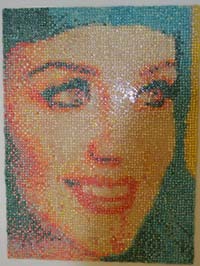 They’ve worked with Tim Powers, who has created art for the Grand Rapids Art Museum, on a bubble-gum portrait of pop-artist Katie Perry. The kids chewed over 30,000 pieces of gum to create the piece in 2013. They’ve created a printmaking mural with ArtPrize artist Melissa Duimstra, for which more than 200 students brought in images from their school career to use to create prints. They’ve created banners for DeVos Children’s Hospital with local artist Reb Roberts. They installed a mural, stretching across a hallway inside the school, that 600 sixth- through eighth-grade students created with help from artist Corey Van Duinen. It incorporates symbols from the school, city, Reeds Lake and extracurricular activities. They created banners that wave in the parking lot with two local graphic designers, Mike and Yolanda Gorman, who own Mr & Mrs design firm. They created two 5-feet-tall duct-tape bears, made of packing peanut and duct tape for last year’s Hearts of Gold football game in honor of the chosen organization Billy Bear Hug. This year for Hearts of Gold, they are recreating the Ele’s Place logo in origami in honor of this year’s fundraising recipient, Ele’s Place, a healing place for grieving children and teens. Lampen is reflective about why she works hard to connect students to the school and community through art. It goes back to the time she decided school just wasn’t for her anymore. Frustrated by the rigidity of school and her lack of passion for it, she bounced from high school to high school, before one day finally dropping off her books and declaring herself “done.” She finished up her credits at an alternative high school and graduated early. “I knew I wanted to do art, and I was frustrated because I couldn’t get enough art in my school day,” Lampen said. She was a free spirit who wanted to use her hands and create, she recalled. She felt confined in traditional school. She was an out-of-the-box thinker who didn’t always view things in black-and-white terms. Instead, she’s colorful in every way, from her clothes, to her bright handmade jewelry to the vibrancy she brings to the middle school, where she has spent nine years. “Some of the kids know my story because they struggle in school,” Lampen said. She said she had never really talked about what led her down her career path from high-school rebel to compassionate teacher, though she envisioned where she was headed at a young age. In sixth-grade, Lampen wrote down her goals for a time-capsule project. Now, reaching students with art that touches the community is her way of filling the void she felt as a student. She wants them to feel like there’s room for “The Artist” in the school makeup of athletes and academic superstars. “It grabs the kids who don’t play sports and it gets them active in school spirit,” she said. 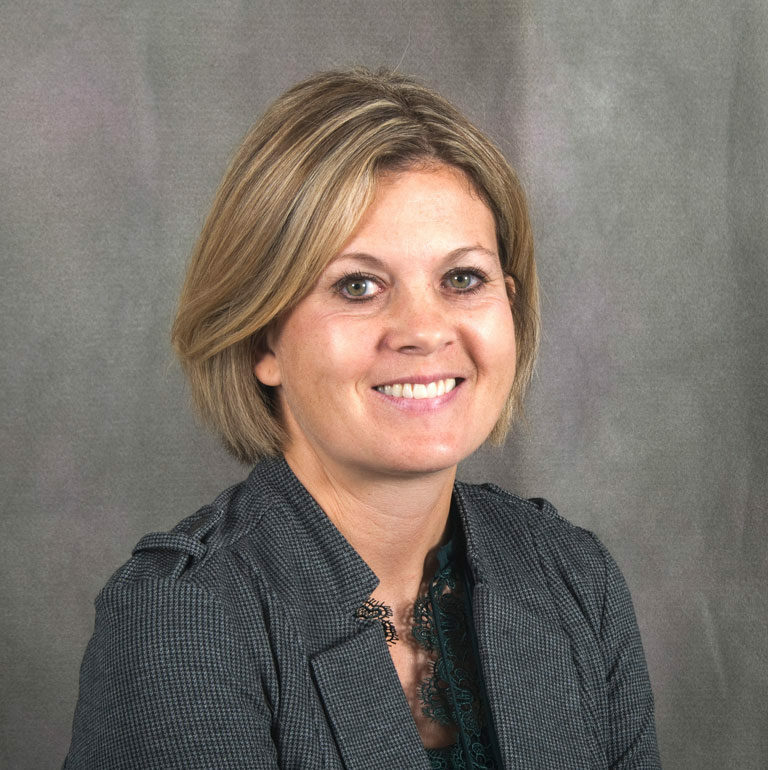 “Holly develops connections with her students in so many positive ways,” Stuursma said. “She simply ‘gets’ kids. She meets them at their level and develops mutual respect.”Principal Peter Stuursma said Lampen has a special way of relating to students. Mairead Steketee, a 2015 East Grand Rapids High School graduate, was one of those students with whom Lampen could relate. After receiving her high school diploma, Lampen headed to the Rhode Island School of Design, where she thrived. The flexibility and chance to pursue her dream as an artist was what she needed. She specialized in painting, but now focuses on sculpture of all kinds with her students because, she says, they love it. 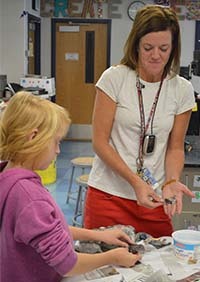 Lampen said she likes to connect with students in a way that allows them to pull out the artist in themselves and embrace possibilities. “Doing art helps kids see there are many solutions to one problem, and working with other people you can accomplish some pretty monumental tasks,” she said. “It comes back to where my struggles in school were when there was always one right or wrong answer. I always felt like there were more possibilities than right or wrong. Lampen knows how to motivate students throughout that process, said East Grand Rapids High School art teacher Terry Szpieg. Student Dillon White made the biggest “bullfrog” in the seventh grade. He echoed Lampen’s sentiment about class. Lampen said she’s glad that message is getting through. “It’s the doing and making of art that helps you grow and figure out who you are,” she said.